Ever since I discovered that Martin doesn't like pancetta I've been toying with the idea of cooking bacon in the Sun Oven. This morning I finally gave it a try; and learned a few things in the process. First, I'm happy to report, Sun Oven bacon is delicious. 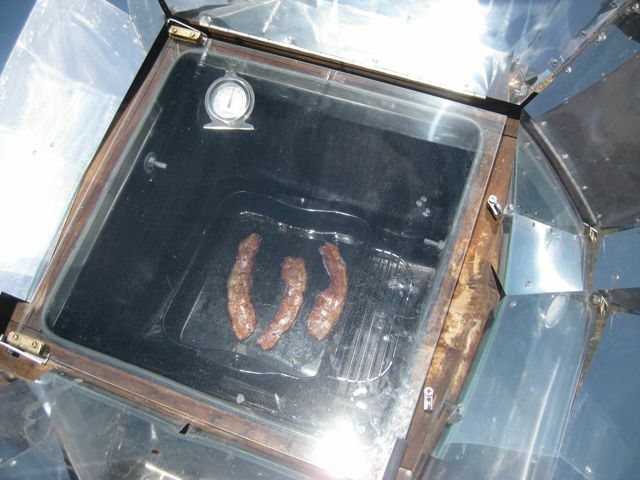 Second, it takes longer to solar cook bacon than it does eggs. The bacon was frozen and I'm sure that was a factor. Before putting it in the Sun Oven I let the broiler pan preheat. To make enough room to cook the eggs and bacon together I removed the leveling tray. I used a broiler pan because I thought the bacon would cook faster if the fat drained off. In hindsight that was probably a mistake. Even though I put the bacon in the Sun Oven about five minutes before the eggs, the eggs cooked much faster. When I took the eggs out, after twenty minutes, I also moved the bacon strips into the tray of the broiling pan. I'd say it took about ten more minutes for the bacon to get crispy. I also covered the eggs this time and they came out overcooked with pale yellow yolks. I think I'll go back to cooking eggs uncovered, it's easier to tell if they're done when you can see them! I don't eat bacon often, partly because it's fattening, but mostly because I usually burn it and I hate the way it makes the house smell. 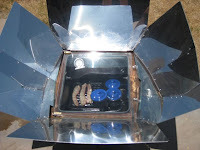 The Sun Oven eliminates the latter two concerns. On Saturday I found pork loin roast on sale. I picked it up thinking I'd use a recipe from my "Cheater BBQ" book, but when I got home I realized I was a little tired of BBQ so it was off to the internet to find a recipe that could be adapted to Sun Oven cooking. I found a few but they all had long lists of ingredients and lots of steps. 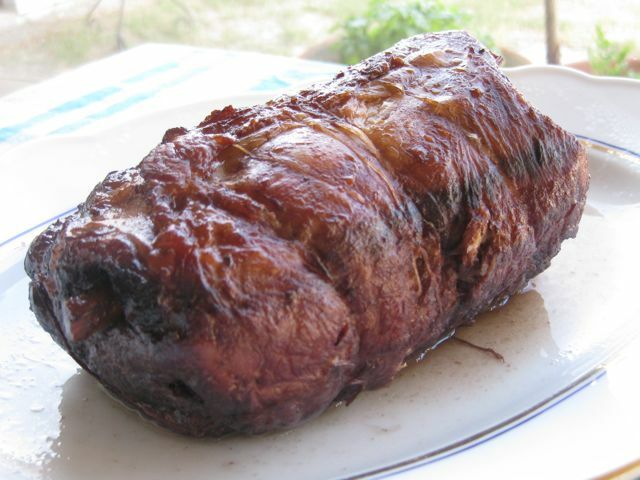 For some reason I don't make loin roast very often, I usually use a shoulder roast for pulled pork or tenderloin for grilling. After giving up on the internet recipes I turned to my favorite Italian cookbook "Essentials of Classic Italian Cooking " by Marcella Hazen. 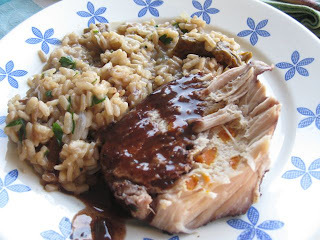 I'd used one of her pork loin recipes years ago and seemed to remember liking it. The recipe is simple, pork loin, carrots, oil, wine, nutmeg, and bay leaves. It also called for two tablespoons of brandy which I didn't have so I left it out. You basically poke holes in the roast, insert carrot sticks in them, brown the meat, and braise it in the red wine. It's supposed to simmer, stovetop, at very low heat for three hours. When it's done the wine should be reduced to a syrupy sauce that is drizzled over the slice meat. She does say to turn up the heat for the last half hour if there's still a lot of liquid left. To solar cook the roast I browned the meat stovetop before transferring it to the Sun Oven. I wanted to keep the temperature between 200º and 250º so I did not focus it directly towards the sun. After three hours the meat was incredibly tender but it looked as if none of the wine had evaporated. I set the lid ajar and turned the Sun Oven into the sun. I could see the liquid bubble away, but it was getting late. In the end I brought the pot inside, took the roast out, and reduced the liquid on the stovetop. The meat came out so tender that it practically fell apart when I tried to slice it. Next time I'll use a little less wine and probably skip the carrots. They look impressive but don't really add much flavor. The reduced wine sauce was delicious and is definitely a keeper.